A Gentleman's Luxuries: Happy new year! Time to sum up, and look forward. Firstly I would like to wish all readers a happy new year. It will hopefully treat you well and live up to all your expectations. We are three days into the new year and I think it's time to take a look at the year that's behind us and also think about the expectations for the coming year, all, of course, from a gentlemanly/sartorial point of view. For me, I think it's been quite a good year where things have generally moved in the right direction. I have tried to tighten my style and make it more consistent, something I've basically done by making certain accessories permanent features of my attire. Previously I've been an occasional tie wearer. Although, I've long been wanting to wear ties regularly, because hardly anyone in my work or home environment wear ties, I've kept it for certain occasions. This has now changed! Putting on a tie has become part of my daily morning routine and it feels good. Even if few others wear ties, I can't let that affect me anymore, I might as well take the lead and possibly someone will follow. Cuff links have also become regular as I've gradually changed my shirt collection to mostly containing shirts with french cuffs. Have you made any changes which have improved your style? This trench coat is probably the purchase I'm most pleased with. It's design is classic and very stylish but it's also highly practical and, with regard to raincoats, I don't think I could find a better garment. Here are some of the details of this coat which will protect you from the elements. Firstly, when you button the double breasting all the way up, the storm flap on the shoulder should button over the top of the breast panel to prevent rain getting into to the top and side of the double breasting. There is also a detachable rain guard for the neck area. In particularly bad weather the collar can be closed by a hook and eye system which again can be covered by the rain guard. This will prevent rain getting under the collar area of the coat. The belted cuffs can also be tightened to further protect you from the storm and rain. Another great feature are the pockets. The pockets themselves are nice and roomy but the special feature is that right behind the pockets there is a slit through which you can reach your trousers and jacket pockets without having to open or lift up the coat and exposing your clothes to the rain. 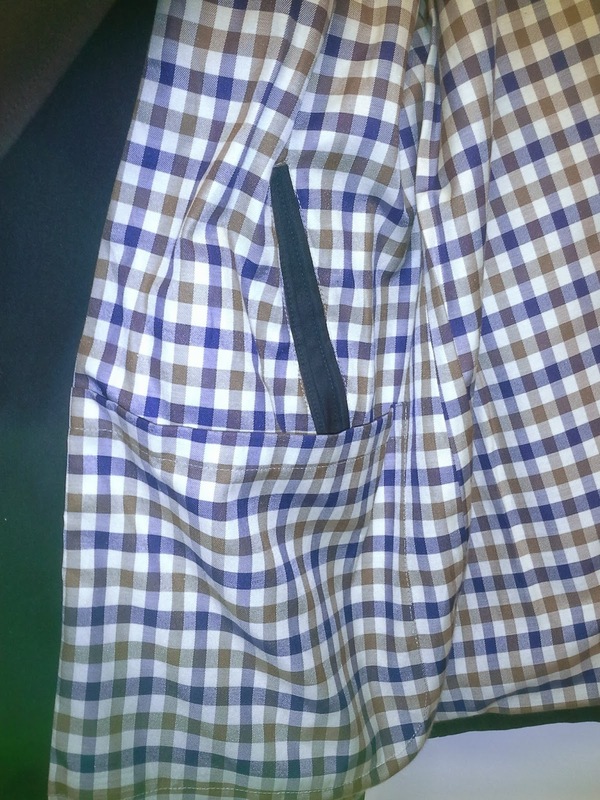 There is also a large convenient inside pocket just underneath the right outside pocket. Posing for the photo in front of the Christmas tree. notice the storm flap on the right shoulder. 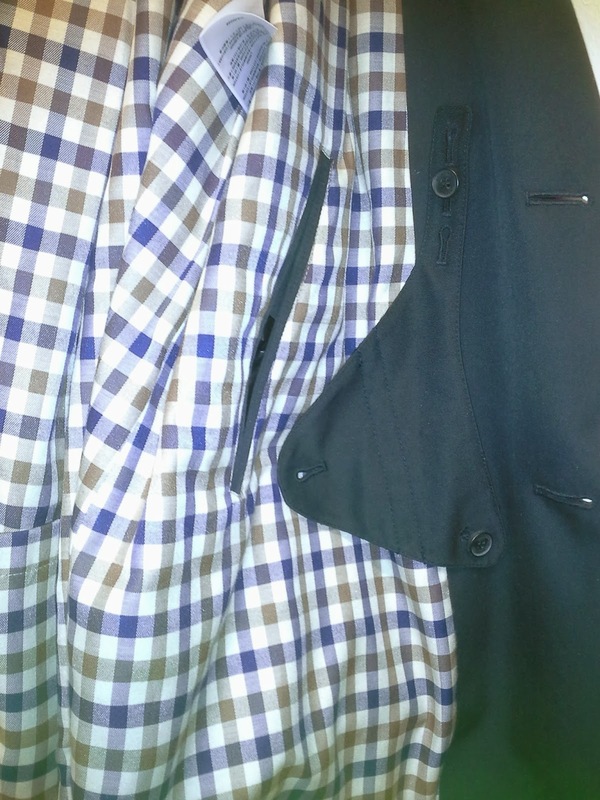 The coat sleeves can be tightened for extra protection. 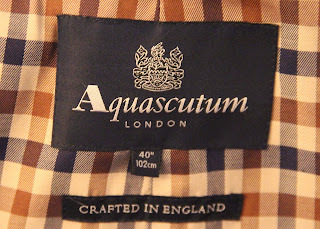 The Corby and other trench coats from Aquascutum are currently available at highly reduced prices. Take advantage of the January sales and get yourself a rain coat which will last you a lifetime. 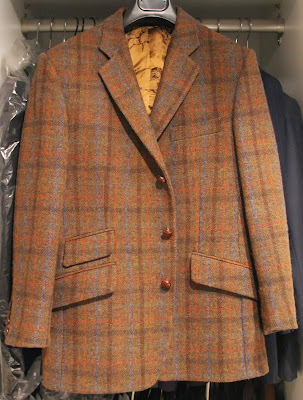 My second favourite of last years purchases is this Harris tweed jacket from Cordings. I find this jacket the perfect choice for slightly chilly days and I also think it looks really good. You can't really argue with a good tweed jacket. Harris tweed jacket from Cordings. Brook Taverner have some great Harris tweed jackets available at very reasonable prices. Have a look at the different colours and patterns to find your favourite. Have you made purchases last year which your are particularly happy with? With regard to the new year I don't really have any new year's resolutions, but I will try to continue to improve my style and be less held back by the sartorially indifferent. This is really something I think any gentleman should do as I firmly believe it will improve the general quality of life. Good luck with all your new year's resolutions, whatever they may be, and all the best for the coming year!